The jab and the straight right hand, also known as a one-two combo or jab cross, are the two most common punches in a fight. When these boxing combination punches are thrown correctly and timed just right, the effect can be devastating. If you want to learn how to throw different types of combination punches, read on for more information from the Gloveworx coaches. Before you do a one two combo, you must first perfect the jab. There's a reason the jab is number one and the first punch you learn during training as a beginner: it's your best hit. A well-thrown jab has a lot of power with minimal energy use. It's simple and effective. The jab is one of the easiest punches to land, making it a an ideal skill to start with for a beginner. Get into your boxing stance. Keep your knees slightly bent, and your hips centered between your feet. Place your left foot forward, slightly angled toward your opponent or bag and your right foot back with the heel slightly off the floor. 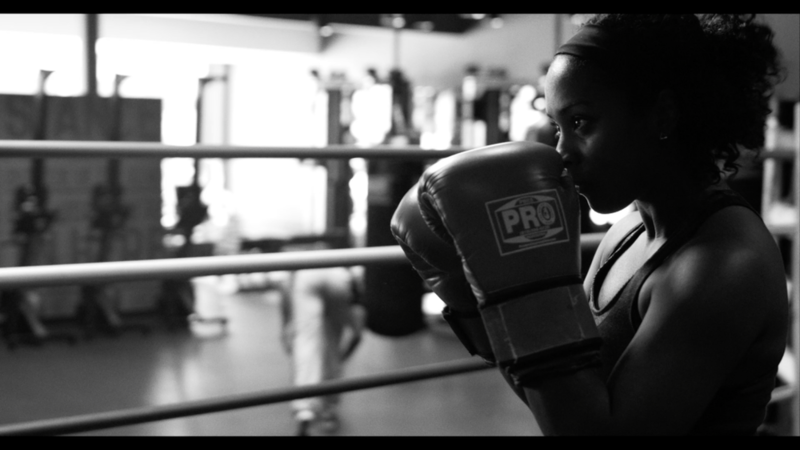 Your boxing stance should be sturdy, but relaxed enough to allow for movement and speed. Your hands should be by your face in a defensive position, shoulders relaxed. Keep your right hand by your ear, as though you're holding a phone. With your left arm, extend straight out to hit the target. Your left foot should stay forward for this. If you're left handed, your right foot and right arm will be forward instead. As you extend, generate power from your back foot by stepping forward. As you punch, your left shoulder, wrist and hand will rotate 180 degrees. Your shoulder will be fully extended and your hips remaining forward to complete the jab. The straight right is a strong power punch to be thrown sparingly. Great form is key when throwing a straight right hand (and a one-two combo) as you can hurt yourself by hitting improperly. Pivot on your right foot and turn your knee inward following the natural range of motion as you extend your right arm. Rotate your shoulder, arm and wrist to get the 180 degree rotation in your fist as you punch. The rotation in your lower body should carry up from your foot, knees, and hips to drive the force of the punch. The one-two combo is one of the best boxing punch combos to have in your repertoire and is often the first combo learned when training as a beginner. The connection point between a jab and a straight right hand to create a one-two combo is a body motion between the jab and the straight right. Throw a jab with your left hand. Slide your back foot forward as your jab arm retracts back into a defensive position, with your left hand back beside your face. Throw a straight right hand as your left fist reaches the defensive position, rotating your hips and shoulders to finish the punch. The one-two combo can be a great way to both distract and attack your opponent in a fight, whether you're sparring in a match, shadow boxing or working the heavy bag. When you have a nice One-two punching combo and put it to good use, you will definitely give your opponent some trouble. Since you can use your jab to gain ring control, you can take advantage of this control and apply your right cross anywhere you want. A straight two is often the quickest and most common to land, so when throwing the jab cross combo, step towards your opponent and bring the power. Completing these punches effectively will ensure your opponent respects you and keeps their distance. If they don’t, they may be waking up on the canvas. Jabbing to the body is great way to throw your opponent off, as most jabs come at them at face height. It’s also an effective move that may cause them to drop their hands in instinctual defense of their body, opening themselves up to an attack on their head. If you’re quick enough and prepared, you can throw a hard, fast two straight at their face and connect with a ton of force and power. An additional way to confuse your opponent includes staring at their body while completing these punching combinations and boxing, as they won’t be sure if your second punch is also heading towards their body or head. The jab with the overhand two is best used when there is no time to waste and you want to get straight to the point. When you stick the jab and come with the straight right from another angle (the overhand right), it can be unexpected due to the fact that everyone is used to the regular one-two combo in the ring. While the overhand right is a bit slower than a straight right, you can use the surprise this punch generates to your advantage. Since your opponent won’t be expecting a two from this angle, you can land hard. This punch is a high risk, high reward move that’s worth the effort once it lands. Adding some variation to your one-two boxing punch combos will improve your ability to control the ring and cause trouble for your opponent. These combos will help you maintain the unpredictability that’s so effective during a boxing match. The more variety you can bring to your combinations, the more dangerous you become. Learn more about how to throw boxing punch combos today when you sign up for a Gloveworx session!